Don't be fooled by the title of this book, it's not just for Pastor's kids (PKs). I believe that Pastors, their spouses, and even their congregations will benefit from reading or listening to this book. 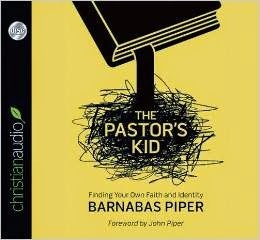 Barnabas Piper, son of well known Pastor John Piper, writes this book about the life of a PK. No one really understands the life of a PK except other PKs, even the pastors themselves can't relate to the hardships and struggles that their children face, unless they too were PKs growing up. If you are reading this, then you may never have thought about how much pressure there is on a PK. There are false expectations placed on PKs from their fathers, mothers, as well as the church. Barnabas Piper uses stories from other PK's as well as some of his own, to bring validity to this issue. This book sheds light on the hurtful and at times detrimental interactions and perceptions that are had between PKs and their fathers, mothers, and the church- to the point that you may feel your toes being stepped on, if you have done any of the things he warns about. For example, there is the expectation placed on the PKs that they should be more versed in the scriptures and then there is disappointment if they are wrong or don't know the answer to all the questions. There is a higher standard of behavior that is expected of the PKs and because of the "fish bowl" they live in, everyone knows of every misdeed they dare to commit. As a Pastor's wife, with a PK of my own, I was reminded that even though ministry is the calling that my husband and I have felt in our lives, that doesn't mean that my son has that same calling upon his. And I enjoyed this book so much, that I have recommended it to my husband to read so hopefully we can avoid some of these issues Barnabas Piper mentions while raising our son. In the foreword, written by John Piper, he states that the book was tough to read since it was written by his son, but that when he finished reading it, he gave it to his 17 year old daughter, still living at home, and had honest dialogue about her feelings and whether any changes need to be made. This is why I HIGHLY recommend that all Pastors and their wives read and heed this book! And from the perspective of a church member that I have been for many years, I saw with fresh eyes the impossible standards that the church has placed on Pastors and their families. It caused me to evaluate my own interactions with PKs in the past and to hopefully move forward with a different approach in the future. Not only are the two reasons I mentioned above why I think this book is for everyone, but also because throughout the entire book there is an undercurrent of Grace. Barnabas Piper's words are rooted in the Gospel and a love for Jesus- which is a message for everyone and a message delivered solidly by this book. He continually describes the grace we have been given by God and encourages the giving of grace to others. The audio book is narrated by Barnabas Piper and I think this is a benefit, because as the author of the book he has perfectly placed inflections and emphasis on the words he's reading. This book is a short and I enjoyed listening to it on my way to and from work. This is my first audio book, but it really made my 50 min drive much more enjoyable. But whether you read it or listen to it, I highly recommend that you get it! And I would like thank christianaudio Reviewer's Program for the audio version of this book in exchange for my honest review. This book is being released on July 1. You can pre-order it from christianaudio.com here. Or from Amazon.com here. When you read the book, I would love to know your thoughts in the comments below. Or you can email me at coverelifeblog@gmail.com. And to make sure you don't miss a post, sign-up for email updates on the right side of your screen.